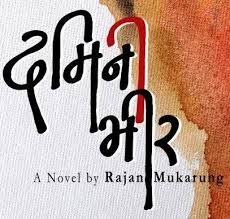 Damini Bhir, written by Rajan Mukaran, is a book which truly deserves the Madan Puraskar it got for the year 2069 B.S. Set in the rural hills of the Eastern part of Nepal, the book revolves around the social lives of the characters that stay in the village of Damini Bhir. The story sets itself during the 10 year insurgency’ period of Nepal. The aakhyan revolves around the lives of different characters such as Lachhi, Kancho, Kanchi Damii, Nembang, Birman, Hangdima etc. The author presents the present and past stories of different characters by weaving them in a simple but artistic plot which seems to lean more towards realism. Rajan Mukarung’s style of presenting the characters noir type of psychological perspectives in short, stiff sentences is truly an original concept. The dialect feels authentic and fresh along with the occasional glimpses of the characters sense of humor. The book starts with a montage of the history of how the village came to be called Damini Bhir. Then the author gives a short history of how the villagers left their homes in search of better lives in the city. The demography of the village is described along with who stays where and what they used to do and their status before they left the village. The author’s writing style and the way he presents the characters day to day lives and their dialogues is authentic and unique. He vividly depicts the lives of marginalized Nepalese living in rural areas. The author has presented the social, economical, cultural and political aspects of the contemporary period of Nepal. he author has written this story based on his life experiences and the anecdotes of the characters that live actual lives. More than half the characters are real people with real names. He decided to write that book after a lot of extensive research and personal involvement. Listen and Download Damini Bhir.